Iceland is preparing for an even more powerful and potentially destructive volcano after a small eruption at the weekend shot red-hot molten lava high into the sky. About 500 people were safely evacuated from the land close to the Eyjafjallajokull volcano, which is around 120 kilometres (75 miles) southeast of the capital, Reykjavik. The country's two airports were closed for most of the day and transatlantic flights re-routed to avoid the risk of ash blocking visibility and destroying engines. After circling the spectacular eruption in a Civil Defence aircraft, Freymodur Sigmundsson, a geophysicist, concluded that the immediate danger was receding and that the lava was flowing along a one kilometre-long fissure. The original fear was that the volcano had erupted directly underneath the Eyjafjallajokull glacier, which could have caused glacial melt, flooding and mudslides. Instead, the volcano blew in between Eyjafjallajokull and the larger Myrdalsjoekull glacier. However, the danger is that the small volcano is just the beginning and that it will trigger the far more powerful volcano of Katla, which nestles beneath Myrdalsjoekull. Icelanders agree. "This could trigger Katla, which is a vicious volcano that could cause both local and global damage," Pall Einarsson, from the University of Iceland, said. 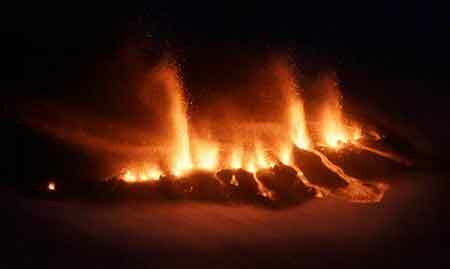 Explosive volcanism is known to be a leading natural cause of climate change. The second half of the 13th century was likely the most volcanically perturbed half-century of the last 2000 years, although none of the major 13th century eruptions have been clearly attributed to specific volcanoes. This period was in general a time of transition from the relatively warm Medieval period to the colder Little Ice Age, but available proxy records are insufficient on their own to clearly assess whether this transition is associated with volcanism. This context motivates our investigation of the climate system sensitivity to high- and low-latitude volcanism using the fully coupled NCAR Community Climate System Model (CCSM3). We evaluate two sets of ensemble simulations, each containing four volcanic pulses, with the first set representing them as a sequence of tropical eruptions and the second representing eruptions occurring in the mid-high latitudes of both the Northern and Southern hemispheres. The short-term, direct radiative impacts of tropical and high-latitude eruptions include significant cooling over the continents in summer and cooling over regions of increased sea-ice concentration in Northern Hemisphere (NH) winter. A main dynamical impact of moderate tropical eruptions is a winter warming pattern across northern Eurasia. Furthermore, both ensembles show significant reductions in global precipitation, especially in the summer monsoon regions. The most important long-term impact is the cooling of the high-latitude NH produced by multiple tropical eruptions, suggesting that positive feedbacks associated with ice and snow cover could lead to long-term climate cooling in the Arctic. The big news this morning is the eruption that started last night at Eyjafjallajokull in Iceland, producing a 1-km fissure vent. The pictures and videos I've seen so far have been quite impressive, with the classic look of a "curtain of fire", where basaltic lava erupts explosively from a linear array of vents - you can see the geometry in the image from the BBC/AP (above). Especially clear is the dual nature of the eruption, with both the explosive fire fountains and the effusive (passive) lava flows from the root of the curtain of fire. In many "curtain of fire" eruptions on Hawai`i, the curtain (see below) eventually coalesces into a single fire fountain, sometimes producing fountains that can reach a few kilometers in height. This will be something to watch for in the coming days if the eruption continues.